My first contact with the SkyTraq Venus 6 was in 2010, when i bought the Navin miniHomer (my personal "Gadget Of The Year 2010") from the german distributor ZNEX. The miniHomer containes a derivative of the Venus 6 series (Venus621bLP). Fascinated by the chip, i ordered the suggested Venus638FLP evaluation kit (EVK), the software development kit (SDK) and some "bare" Venus638FLPx-L chips in LGA69 package (10mm x 10mm x 1,3mm). The shipping of the kit was very fast (3 days from Taiwan to the destination). The customs formality and paperwork was done by the carrier FedEx, importation VAT has to be paid for the kit. At the 30-pin header a Honeywell HMC6352 compass chip on a Sparkfun breakout board is connected. The SDK and API documentation is very slim. Therefore i did a complete rework of the SDK (SkyTraq kernel 1.6.0), reorganized andreformatted all the code and added Doxygen comments. Additionally i ported the AVR FAT32 package to the Venus638 and added some low-level I2C routines ("bit-bang" mode for Venus634 compatibility, and also hardware I2C functions for the Venus638)and some high-level routines for the Honeywell HMC6352 compass IC. The modified and extended sources, packed as STI_GPS_ModTG_v0.0.2.zip can be downloaded and used in own projects (send an e-mail with a little description of your project to get the password. 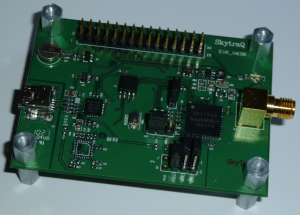 Made for SkyTraq kernel 1.6.0, no kernel libs included). A Cadsoft EAGLE library SkyTraq_Venus63x.lbr provides schematic symbols and layout footprints (created with Eagle 5.11.0). • The Venus634/638 uses the Sparc v8 compatible LEON2 CPU (free IP-core by Cobham Gaisler ex. Aeroflex Gaisler). • The LEON2 inside the Venus638 runs with 50 MHz, the internal peripherals (e.g. SPI, I2C) with 15.003694 MHz. • The PIOs are I/Os from the LEON2 design, the GPIOs are additional peripheral I/Os. • A bricked Venus638 FLASH can be reprogrammed by booting the chip from ROM (JP3 2-3), download a prom.bin with the GPS-Viewer and restart the chip from FLASH (JP3 1-2). • The SDK works also with the sparc-elf-3.4.4-1.0.33 toolchain, on Windows and Linux (Unfortunately the links to the toolchains were dead, so they were removed). Be aware, that SkyTraq maybe will refuse support if you do not use the suggested v1.0.31b toolchain!! Gaisler toolchains above v1.0.33 will compile the sources, but the binary will not work on the Venus63x! • Create a directory "C:\opt"
• Unzip the sparc-elf-toolchain to "C:\opt" to get the following structure "C:\opt\sparc-elf-3.4.4-mingw\..."
• Unzip the SDK to "C:\opt" to get the following structure "C:\opt\STI_GPS\..."
• Download the GnuWin32 "Core-Utilities". The Core-Utilities contains the missing helper binaries. Start the installer. Set the installation directory to "C:\opt\GnuWin32". obj/nmea.o obj/uart_intf.o lib/gps_main.o lib/uart.o lib/binmsg.o lib/pll_clock. Copyright Gaisler Research 2004, all rights reserved. • For a detailed information about the prom.bin, download the MinGW "GNU-Binutils". • Extract "size.exe" from the downloaded file (e.g. with 7-zip) and copy it to "C:\opt\GnuWin32\bin". • Now "\bin\prom.map" contains the mapping information of all the variables of your code. • "gps_process()" has to be called cyclically inside the main loop, otherwise, the chips watchdog will do a system reset after about 60s. • UART functions must not be used before calling "gps_init()", otherwise the CPU will hang. • The Venus638 uses the SPI master core from Opencores.org. • The SPI can run with a maximum of about 7.5 MHz (periph. bus frequency / 2). • If the SPI-master is used, PIO5 acts as alternative function SS #2 of the SPI. The pin can not be used as a GPIO in this case. • A Yamaichi "FPS009-3202-BL" SD-card socket fits the pads on the bottom of the Venus638-EVK. 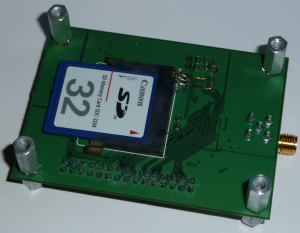 • For a proper operation of a SD-card, the MISO (pin 7 of the card socket) must be pulled to VCC33 with about 10k. • The Venus638 uses the I2C controller core from Opencores.org. • The I2C core can only be used in polling mode (polling "TIP", no IRQ).